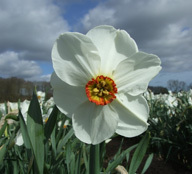 A lovely “pheasant-eye” type variety, with a red and green small cup and pure white petals. Mid-season flowering with a delicate perfume. 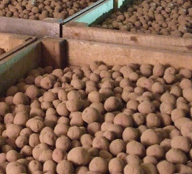 A stunning new double variety, golden yellow and a true bright red, by far the best on the market. 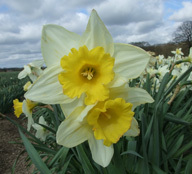 Mid-season flowering with a strong stem to support the flower whatever the weather. 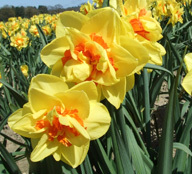 A classic yellow trumpet daffodil, golden yellow large flower with a strong, thick stem and very early flowering. It also has a slight scent. 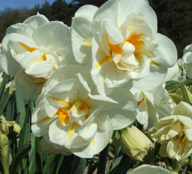 A miniature variety, multiheaded with lovely white and yellow double flowers. 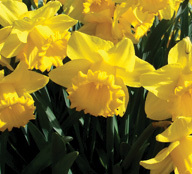 It creates a great early show outside, but can also be grown in pots indoors where it will fill the room with its sweet scent. 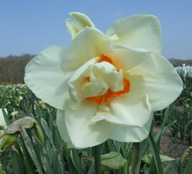 A multi-headed white and yellow double flowered variety. 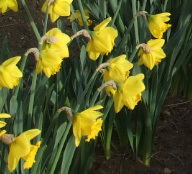 Flowering towards the end of the season, it is free flowering and will produce a wonderful display in the garden and fill the area with it’s sweet scent. This is a new variety and a really spectacular flower. 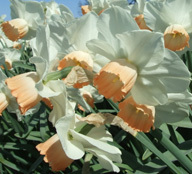 A large white and pink double flower is upward facing and is held on a strong stem. 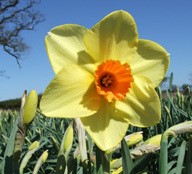 Something new for the daffodil market. The double flowered combination of white and red is particularly striking in this new variety. 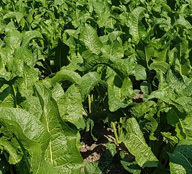 Tall but with a strong stem its late flowering helps to extend the season well. 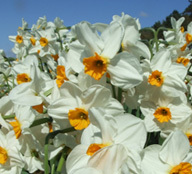 Very vigorous variety producing large white and pale yellow flowers. Mid season flowering. This true pink variety has a large flower with a lovely deep pink cup and pure white petals. 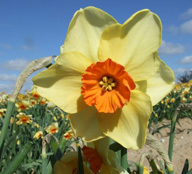 Mid-season flowering. 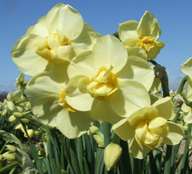 Many tall flowers on this yellow and red variety, late flowering. 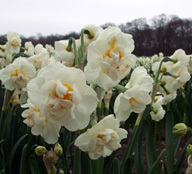 A multi-headed variety, free flowering and highly scented. Flowers towards the end of the season. 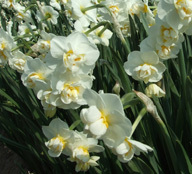 Up to 9 delicate flowers on each stem, giving this tazetta variety a wonderful scent. 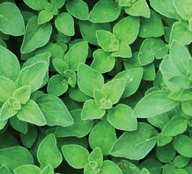 Can be grown in pots on the patio or in the border. 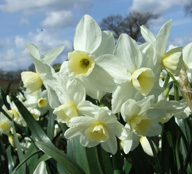 Early flowering and produces many flowers of white and pale yellow, fading to almost all white. 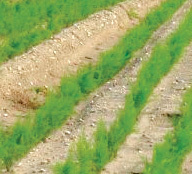 This variety created quite a stir when it was first introduced. 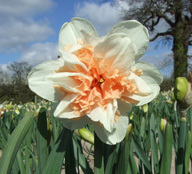 A wonderful frilly flower, white streaked with orange, and many heads per stem, giving a truly wonderful scent.